Four unique timepieces with see-through cases and tiny white gold alien figures. 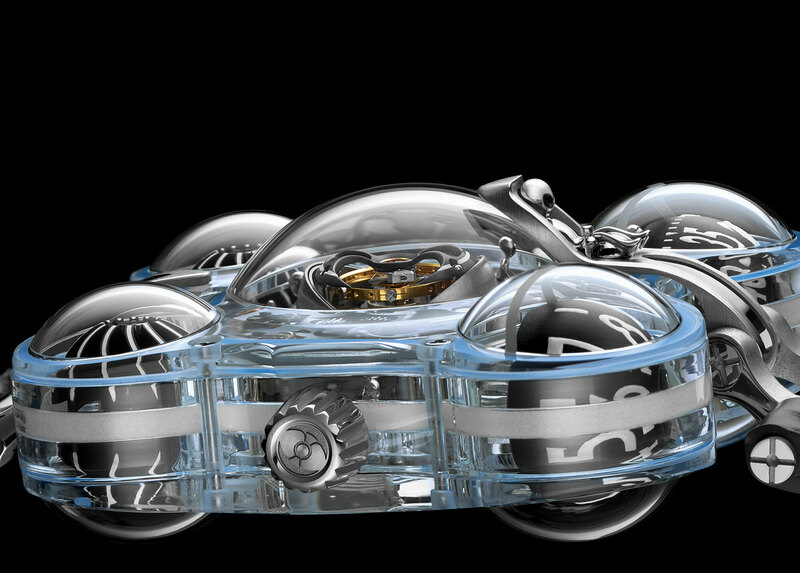 Each crewed by six tiny alien figures, the MB&F HM6 Alien Nation is a series of four one-off watches, all sharing the same clear sapphire crystal watch case but distinguished by different colours accents. 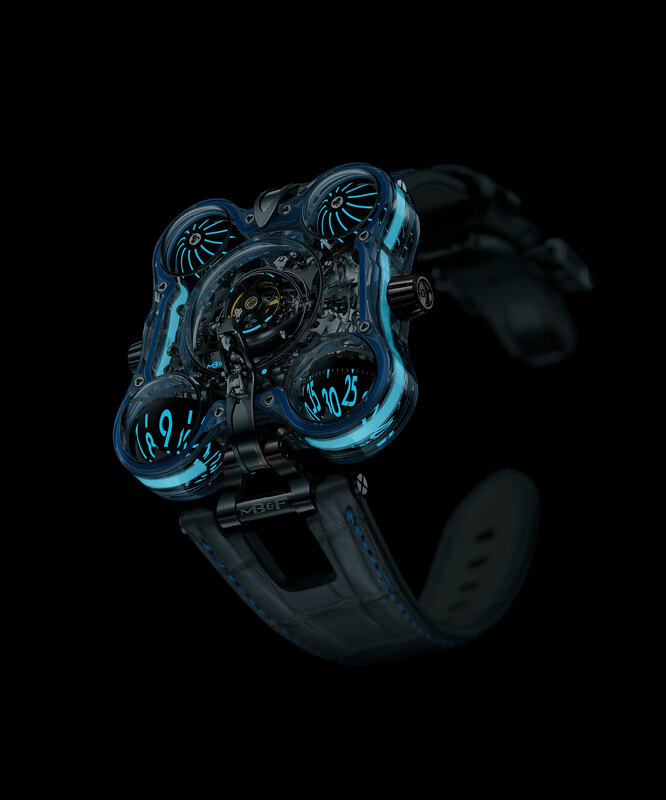 The case is made up of 12 pieces of sapphire, joined together to create an imposing yet transparent watch that measures 50mm wide, 51mm long, and 22.7mm high. The lug attachments and braces on each end of the case are titanium. Offered in green, blue, purple and turquoise, the coloured accents are either Super-Luminova or for the larger sections, AGT Ultra, a resin impregnated with luminescent material. Together they give the case a remarkable glow in the dark that highlights the shape of the case. 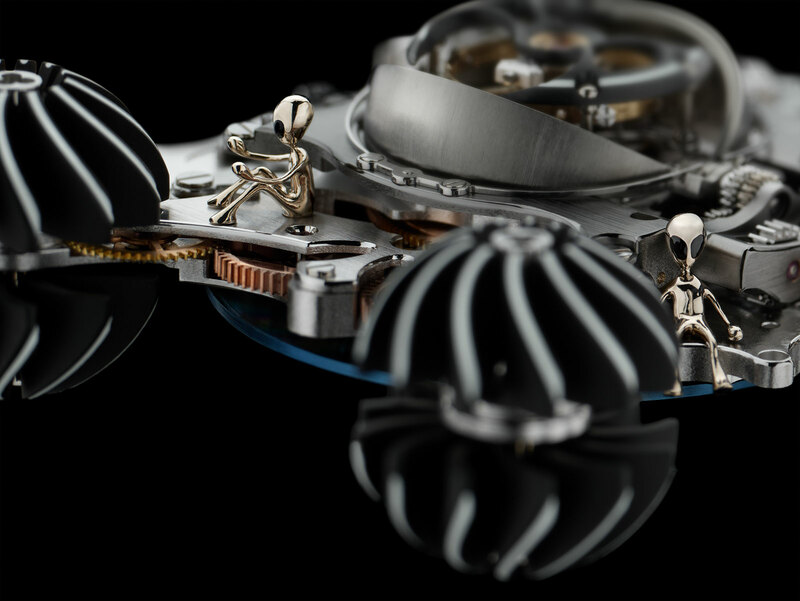 Each of the tiny alien figures scattered around the watch, including one sitting in the captain’s chair on the front of the case, is engraved by hand in solid white gold. 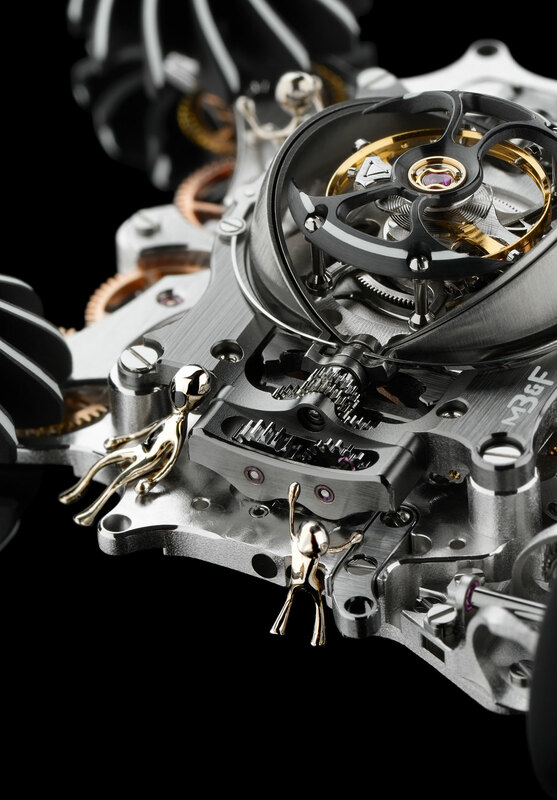 The movement inside is mechanically identical to that of the original HM6 Space Pirate, with the centrepiece being the flying tourbillon in the centre that has a retractable titanium cover over it. 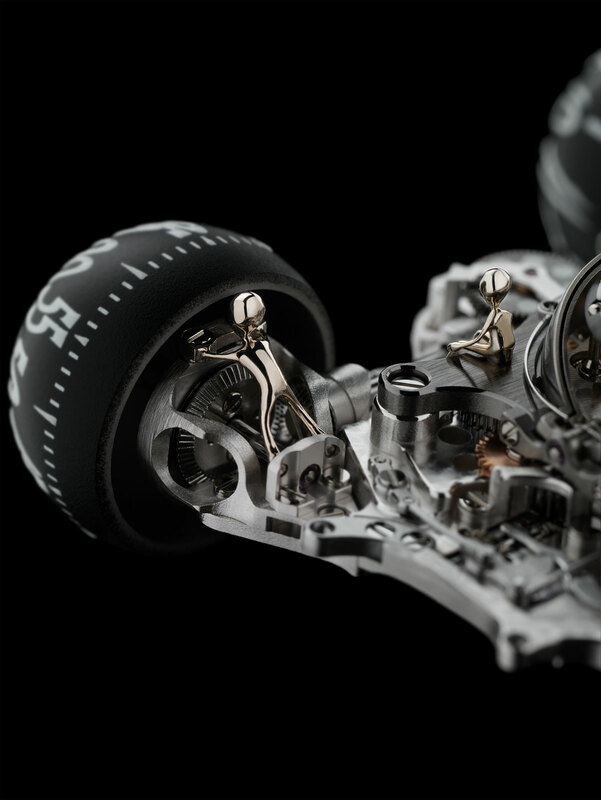 Self-winding with a 72-hour power reserve, the calibre has a platinum rotor shaped like a battle-axe on the rear, a signature feature of the brand’s watches. 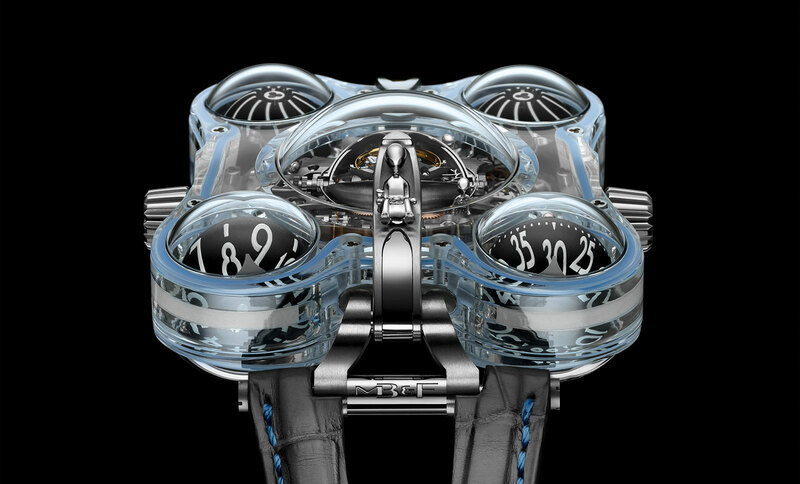 Time is indicated on the two spheres on the lower corners of the case, while the two sphere on the top half feature turbines that spin with the motion of the wearer’s wrist. The crown on the right of the case winds and sets the movement, while the crown on the left retracts the cover over the tourbillon. 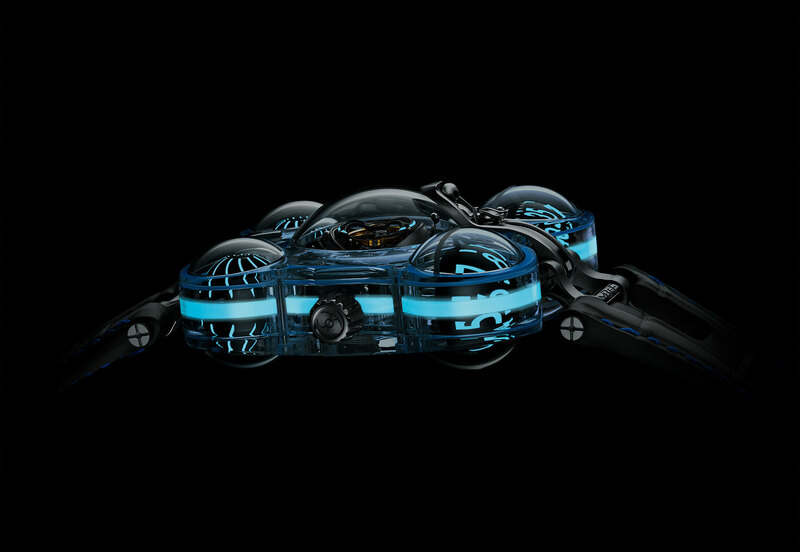 The HM6 Alien Nation is priced at SFr500,000 each (about US$514,000) and according to MB&F, all four have been sold. 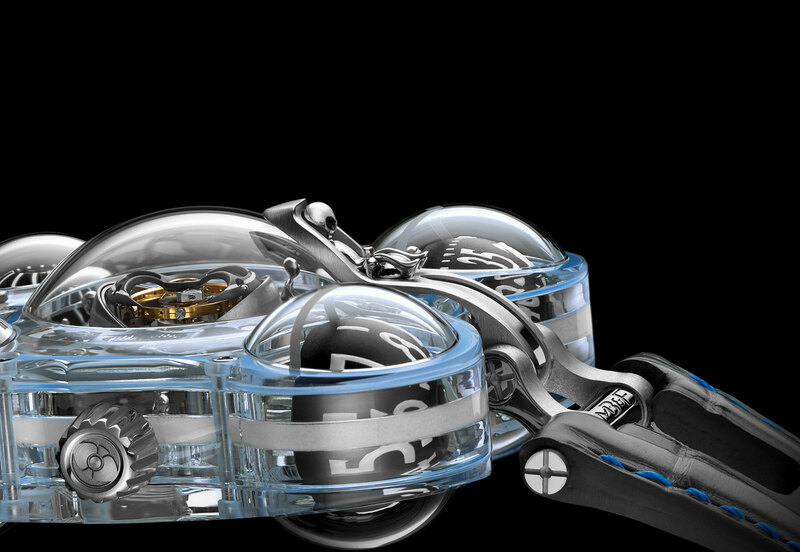 MB&F's second outing with Alain Silberstein gives the LM1 a facelift in the distinctive, whimsical style of the French designer. In a limited edition of 18 pieces with a metallic blue-green face.